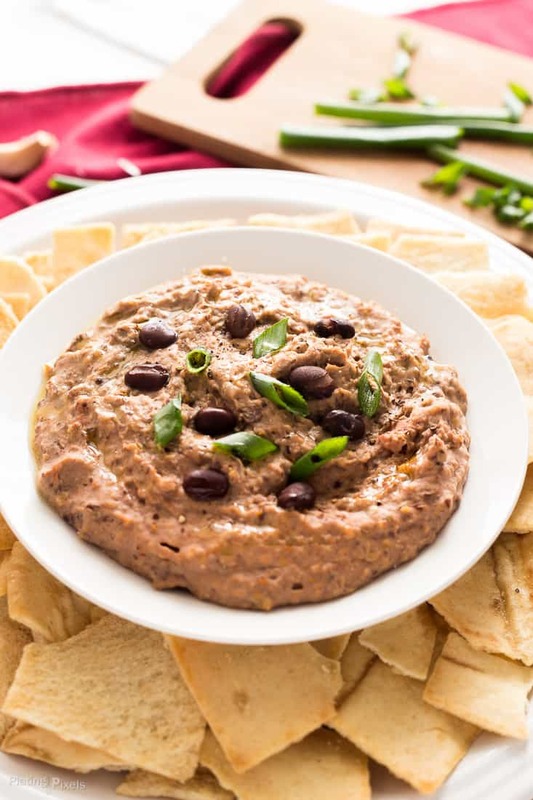 Quick and easy Sun-Dried Tomato Black Bean Hummus appetizer ready in less than 10 minutes. Made from natural ingredients and is vegan and gluten-free. 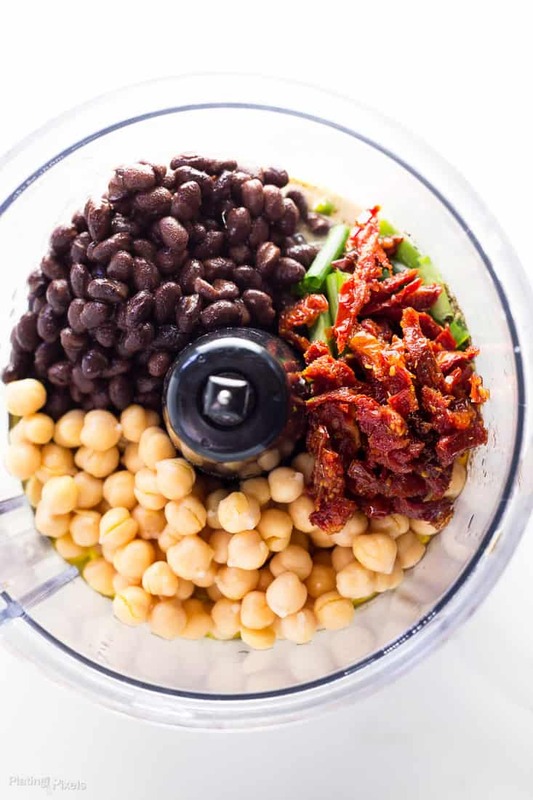 Includes black beans, chickpeas, tahini, sun-dried tomatoes, and green onions. Within this post, you’ll make a simple flavorful appetizer with common pantry ingredients. Plus you’ll learn about tahini and what it’s made from. This appetizer is a snap and requires hardly any effort or time for easy hosting or simple wholesome family snacks. Just a handful of items and a food processor is needed. 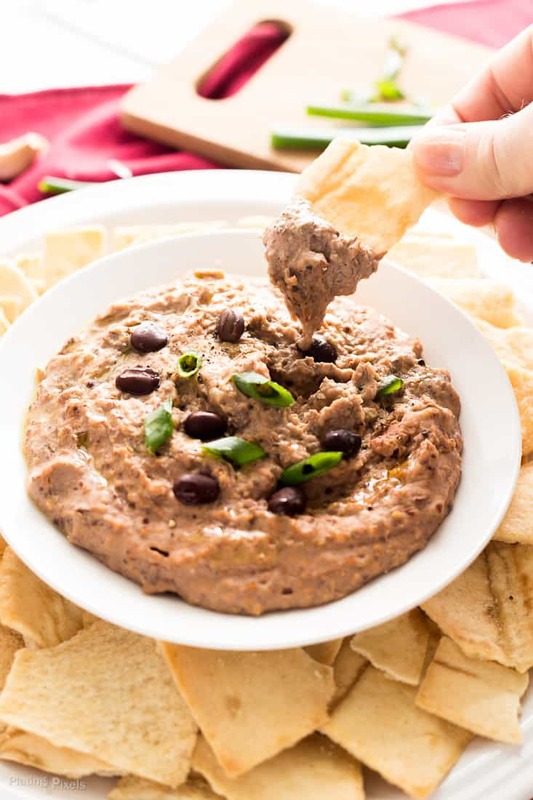 If you want a quick and simple holiday appetizer then look no further than this sun-dried tomato black bean hummus. Black beans: Canned black beans are used to make this easy. Chickpeas: Canned as well. Try to go for good quality ones as they tend to have a creamier consistency. Sun-dried tomatoes: packed in olive oil and drained for loads of flavor. Tahini: the key ingredient for making hummus. Add all ingredients including chickpeas, tahini, olive oil, garlic, green onions, spices and jarred sun-dried tomatoes to a food processor. Pulse for a minute or two until smooth and creamy. I used bagged pita chips for a quick dipper and to speed things up, but also included directions for baking your own from scratch. You could also use a handheld immersion blender or stand mixer, but will be more difficult to work with and to get the proper consistency. What is tahini and can you make it yourself? Tahini is a Middle Eastern sauce or paste from ground toasted sesame seeds. It’s made from hulled seeds that are separated from the bran. You can make it from unhulled seeds but it will have more of a bitter flavor. This post from Inspired Taste has details on making your own. However, prepared tahini is more than fine and ideal for this recipe. Tahini is a staple ingredient in traditional hummus, along with chickpeas and olive oil. 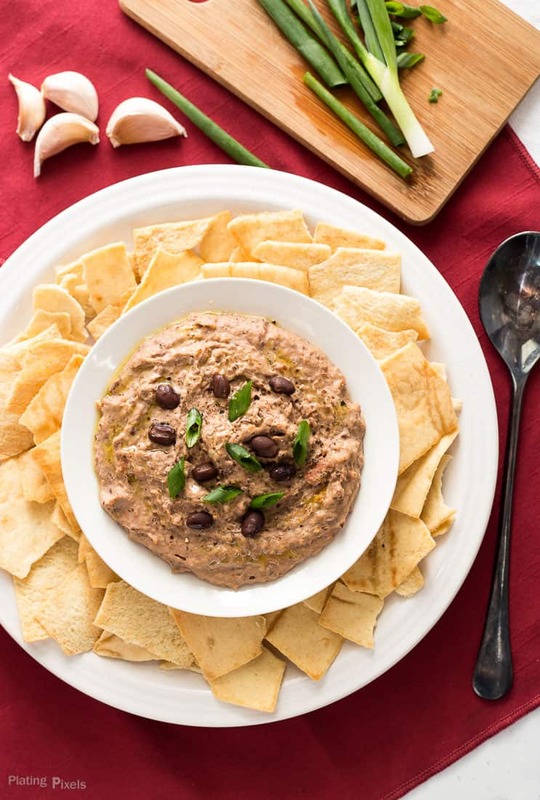 It goes surprisingly well with the flavor of black beans, which is why it’s included in this hummus recipe. You can serve this hummus is so many ways, such as tortilla chips, pita bread or sliced fresh vegetables such as bell peppers, carrots, and celery for a healthier option. This hummus would also make a unique topper for tacos, burritos, tortas or even burgers. Make the night before and store it in the fridge covered in plastic wrap. Let sit about 15 minutes at room temp to soften before serving. It will store sealed in the fridge up to a week, but won’t taste as fresh. You could also try freezing hummus if you have a lot of leftovers and want to make a big batch in advance. Use high-quality and organic black beans and chickpeas for best flavor and texture. You can use any store-bought tahini from white sesame seeds. Use fresh garlic instead of powder for best flavor. Feel free to add other spices such as chili powder or cayenne pepper. Use extra virgin olive oil for rich flavor. You can serve this hummus with whatever you like, but I recommend pita or tortilla chips. You can prep this hummus in advance and store it sealed in the fridge for 1-2 days. Let sit at room temp a bit to soften before serving. 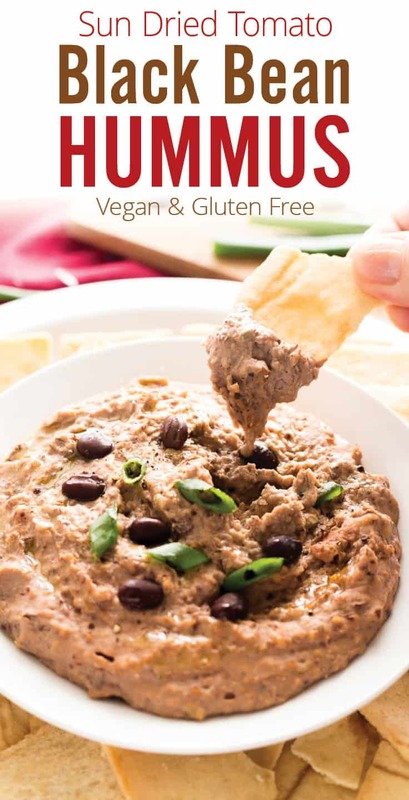 Black bean hummus makes a quick and easy appetizer that's healthy, vegan and gluten-free. Add all ingredients (except pita chips) into a food processor. Process until smooth and creamy, about 1–2 minutes, scraping sides as needed. If too thick, add water or olive oil, 1-tablespoon at a time. Place in a bowl or dish and garnish with fresh sliced green onions. Serve with store-bought pita chips or desired side. To make your own pita chips: Cut fresh pita bread into triangles. Lightly coat with olive oil and sprinkle with salt. Bake at 400º F. for 10–12 minutes, or until desired crispness. This hummus looks so delicious! Can’t wait to make it! You just convinced me to try this hummus recipe. Never thought this is so simple and easy to re-create… Yumminess overload!! It totally is Calleigh and hope you do try it! It is a fun twist. Glad you agree Julie. Sometime I plan to try dried beans from scratch, but canned seems fine to me, especially if you go with organic. This is now my go to hummus recipe! It was so delicious and I can’t wait to try it again! Wow that’s awesome Jessica and thanks so much for the feedback! That’s a lovely variation of hummus, I usually either make classic chickpea hummus or black bean dip. I guess it’s time to try and combine the 2 and see how I like it. Your recipe sounds delicious! It absolutely would be perfect. Thanks Mimi and hope she loves it! Wow 14 posts in December?! You have been working hard and have certainly earned a break with lots of this dip and family time involved! Happy Holidays! I’m sure you know how busy it can get Vicky. Thanks and have a wonderful holiday too! Yummy! I want to immediately eat this hummus. I love your pictures. They are absolutely mouth-watering. Thanks for sharing this delightful recipe! Thanks so much and you’re welcome Aarika! I’m about to see my inlaws in a few weeks and I know they’ll LOVE this! I’m pretty sure they will! Thanks Chrisy! Mmm, I love hummus, and this recipe sounds perfect. I even forget sometimes Samantha. So yummy and simple. I’m sure it’ll be a hit and have fun! WOW!! I love all of those flavors and yet have never thought to incorporate them in one single dip. Can’t wait to try it out! They do work well and hope you enjoy! Thanks! I have always wondered how to make hummus…because I absolutely love it! Thanks for telling me how! Hi Sue! It’s so easy and you totally should try it! 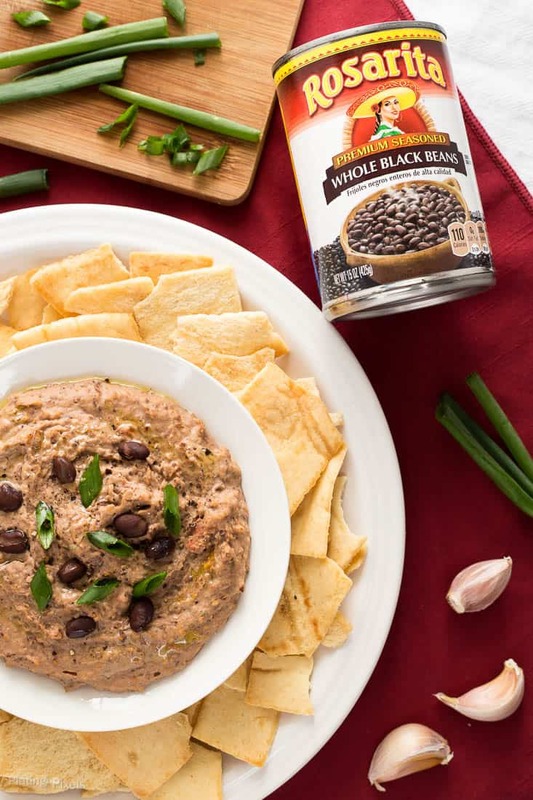 Love hummus, but haven’t tried black bean hummus. Great idea about bringing this for potlucks. I highly recommend it. Thanks Debbie! I’ve not tried a black bean hummus before, I think this will be my first! I really love sun dried tomatoes. The black beans work great and can basically replace chickpeas in even proportions. Thanks Diana! It sure would be! Thanks Marie! Love sun dried tomatoes, what a nice flavor pairing with hummus. Pinning to try, thanks! You’re welcome and thanks Amanda! Well that’s perfect then. Enjoy and thanks Cianna! I am a huge hummus lover! My favorite is sun-dried tomato and basil. This version sounds fabulous too! I love the combination of ingredients! That’s one of my favorites! Olives too. Thanks Willow! Hummus is one of my favorite snakes/appetizers and this one sounds absolutely delicious! Thanks for sharing! Two of my favorite things. Hope more people realize how easy and good for you this is. I even forget how simple it is sometimes. Thanks Candy! Oh my gosh I need/want that!! Thanks for the recipe – Pinned!! Then you totally should! Thanks Heather! wow, yum! I’ve never made my own hummus, but I think I’m going to start with this recipe!! thanks for sharing!